Our flock ranges in size, but we prefer to have assorted breeds of brown egg layers. We do not force molt or clip beaks. Our chicks come to us as day-old peeps and are raised in a warm brooder until they can be moved to the "Hen RV" otherwise known as a chicken tractor, or coop-on-wheels. Only during very cold spells are they kept inside when the danger of frostbite and deep snow keeps them happily hanging out within four walls. The majority of the year our girls (and Bob the Rooster) are freely roam our farm. Most of the time we use electric poultry netting to keep them moving on pasture following our cattle. In early spring before the garden is planted they roam without a perimeter fence. (The electric netting we use later on in the summer helps them from destroying crops and feasting on my tomatoes.) Following the cattle on pasture allows them to do fly-control, while also eating plants the ruminants left behind. All of our hens are omnivores feasting on bugs, plants, and high quality grain. Like all of our products, our eggs are packed full of nutrients and their bright yolks are impressive. We started raising chickens for meat in 2005. We purchase day old chicks and get them out as pasture as soon possible. We use a high quality grain and encourage foraging by using mobile, chicken pens that don’t have a floor. After 8 weeks our chickens are about 4 pounds and are sold whole with the neck, liver, and heart included. We also offer parts (breasts, wings, thighs, etc.) in 1-2 pound packages. Our flock of turkeys wins the award for the “Most Entertaining” animal on the farm. 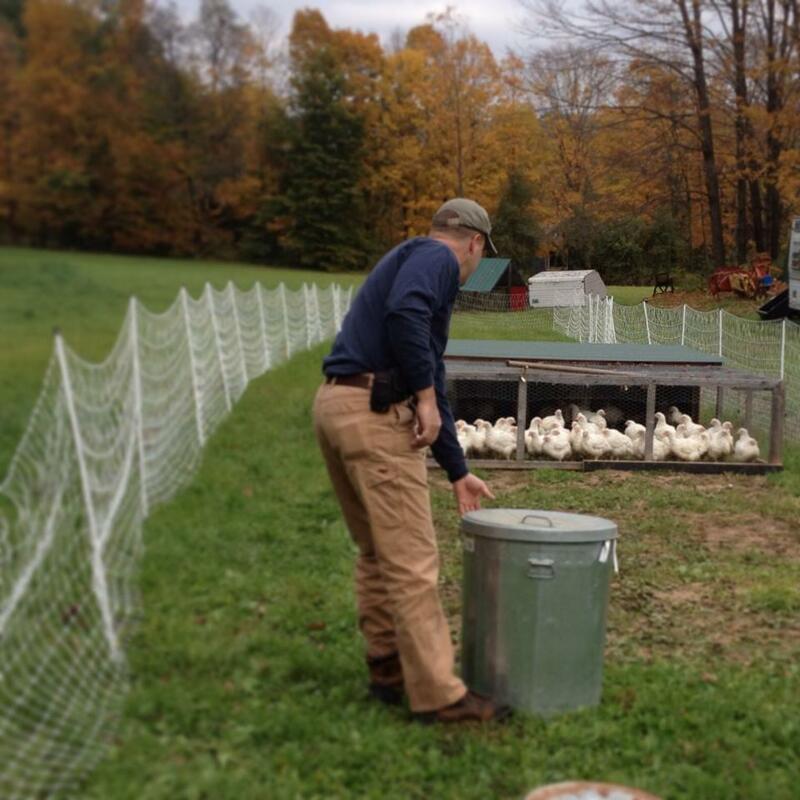 Like our pastured poultry, our turkeys are moved daily onto fresh pasture. This keeps them clean, with a fresh area to forage, and more akin to a life of a wild turkey. We supplement their foraging with a high quality grain ration. Being inside at night helps to protect them from prowling predators. In the morning, they are out roaming and off exploring for the day. You might have seen them when driving past our farm in September while they fertilized our front pasture. We take reservations for our Holiday Turkeys as they sell out each year. (Head on over to the “Shop” page to reserve one now!) They range in sizes, but are sold whole and are between 12-25 pounds. We also offer pieces (ground, legs, thighs, wings, bone-in breasts). With so much “green-washing” in the world of Natural Foods it is imperative to “Know Your Farmer”. Google where the turkey you purchased last year was raised. If their website just gives you a picturesque image of a barn you can bet that your turkey was raised locked inside that barn. On a farm you should see animals outside! We pride ourselves in being a transparent farm operation. If you have any questions please reach out. We can tell you that these turkeys were raised with a lot of love and care. We think you’ll be able to taste the difference!